The Project SEARCH Class of 2018 at Penn State College of Medicine. From top-left to right are Bryce Boyer, Cheyanne Wilson, James Silver, Ava Pyles, Ethan Parrish, Marissa Nice, Emily Swanic, James Morrison and Samantha Brace. For the first time, 18-year-old Cheyanne Wilson says she feels noticed for who she really is—and encouraged to become all that she can be. “I always felt different my whole life—this is the first time that people look at me like I’m a person,” said Cheyanne, who is spending the school year as a Penn State Health intern through Project Search, a program with more than 500 sites across the globe that teaches students with disabilities transferrable, marketable skills in a real work setting. The Harrisburg youth is challenged by her internship in the Penn State College of Medicine Clinical Simulation Center and excited about upcoming internships in endoscopy and patient transport before she walks across the stage in Junker Auditorium at the Project Search graduation in May. Cheyanne and eight other students from area school districts served by the Capital Area Intermediate Unit meet every weekday morning in the Project Search classroom, located on the ground floor of Penn State College of Medicine with instructor Ann Vacchiano before heading off to their internships. “Part of the program includes learning soft skills that are needed to be successful in a job—things like communication, taking initiative, elevator etiquette,” Vacchiano said. The program, now in its fourth year at Penn State Health, provides students with three internship experiences within 18 departments. They may clean mannequins in the simulation lab, restock café items in food services or prepare tubes in endoscopy. Mentors from each department are paired with each student. The program benefits Penn State Health by fostering partnerships with school districts and local employers, and it has provided some great employees to Penn State Health, Iovino said. At least one intern from each class has been hired upon graduating. See photos of the Project Search students on Flickr. For students like 18-year-old Bryce Boyer, of Hummelstown, Project Search fosters self-esteem he never had. The students’ joy in interacting with people who see their potential is unmistakable. In high school, Cheyanne worked at the local elementary school library, shelving and scanning books. She didn’t love it, but she assumed it was the only job she would ever get. Not anymore. “Now I can see I have more options, and I can get a better job,” she said. It’s always been 18-year-old James Morrison’s dream to work at the Disney store in Hershey, and Project Search is teaching him the skills he needs to get a job and live on his own, he said. James is a fan of “Moana” and “Frozen,” both of which feature heroines who overcame adversity, just like him, he said. He learned early on that kids thought it was fun to pick on him, but at the movies, he can escape. “I love the action, the music and the magic,” said James, as Cheyanne jokingly warned him not to start singing theme songs from either flick under any circumstances. Project Search student Cheyanne Wilson, right-center, jokes with Emily Swanic, left, during an icebreaker game. From left are James Silver, Samantha Brace, Ava Pyles and James Morrison. The easy banter between students is another benefit of Project Search. Some of their best friends are in the program, and other new friends are the employees in their internship departments, they said. 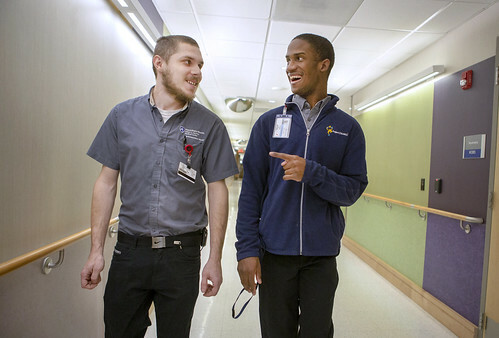 Steve Meminger, Penn State Health patient transport supervisor, said it’s rewarding to see the relationships that grow between department staff and interns. Now, when he thinks about the future, he feels a new optimism that he can get a job and, eventually, his own apartment. “Just because I have a disability doesn’t mean I’m not capable of doing a good job,” said Project SEARCH student Bryce Boyer, as he works at the Rotunda Café. Entry filed under: Features. Tags: disabilities, internship, Penn State Health, Project Search.